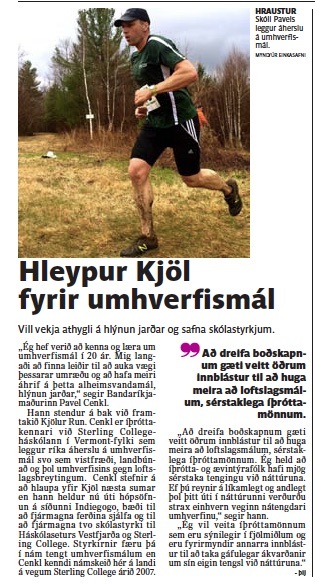 The Kjölur Run project has made international news in the Nov. 24th issue of Iceland’s largest newspaper, Fréttablaðið! Environmental Advocate Wants to Draw Attention to Global Warming and Raise Scholarships. “I’ve been teaching and learning about the environment for 20 years. I wanted to find ways to increase the gravitas of this debate and that more affect this global problem, global warming, “says American Pavel Cenkl. He stands behind the initiative Kjölur Run. Cenkl is Athletic Director and Faculty at the Sterling College University in Vermont, which emphasizes environmental topics such as ecology, agriculture and stability of the environment from climate change. Cenkl aims to run across Iceland next summer, but he now has launched a page on the site Indiegogo, both to finance the trip itself and to fund two scholarships to University Centre of the Westfjords and Sterling College. Fellowships will support students in studies related to environment and recreation. Cenkl taught a course in Iceland on behalf of Sterling College in 2007. “Spreading the message could inspire others to consider climate change – particularly Athletes. I think sports and adventure enthusiasts have a very special connection with nature. If you push yourself physically and mentally your stamina in nature must immediately be connected more closely the environment,” he says. Kjölur Run article in Trail Runner Magazine!